For some reason, I've been seriously craving pizza lately. I made a classic tomato and mozzarella version last week, and wanted to experiment with something more interesting next. I had the idea to turn a classic beet salad into a pizza and decided to use Gorgonzola instead of the more common goat cheese (I love me some moldy cheese). I know I wanted to incorporate arugula, but didn't really just want to pile it up on top of the pizza. I mean, is there any good way to eat pizza with a huge pile of leaves on top without having them all fall off? I was also looking for a way to add moisture to the pizza and decided to kill two birds with one stone by making an arugula pesto to use as pizza sauce. I enjoyed the way the final pizza came out - the different components definitely worked well together to make a tasty pie. My pizza craving isn't gone though, and I've got more pizza dough in the freezer...so what toppings should I play with next?? Some tips: I like to form the pizza on a piece of parchment paper placed on the pizza peel. That way, the pizza and parchment slide easily into the oven. Also, if you don’t have a pizza stone, you can bake the pizza on a large baking pan. This recipe makes more pesto than you'll need for the pizza. You can eat the leftovers with pasta or as a sandwich spread, and you can freeze it if you want to store it for a while. Preheat oven to 350 deg F. Put beets in a baking dish with enough water to cover the bottom of the dish to a depth of 1/8 inch and sprinkle with salt. Cover tightly with foil and bake the beets in the preheated oven until they can be easily pierced with a sharp knife, about 1 hour (this could take more or less time, depending on the size of the beets). Remove beets from the oven, uncover the pan, and cool the beets. Cut off their tops and roots and rub off the skins. Cut beets into ¼-inch slices. If you have a pizza stone, place it on the bottom rack of the oven. Increase oven temperature to 500 deg F (or as high as your oven can go). While beets are baking, combine arugula, walnuts, and cheese in the bowl of a food processor and process until coarsely chopped. Add olive oil and process until smooth. Season to taste with salt and freshly ground black pepper. When oven is heated to 500 deg F, stretch dough out to a 16-inch round on a pizza peel. 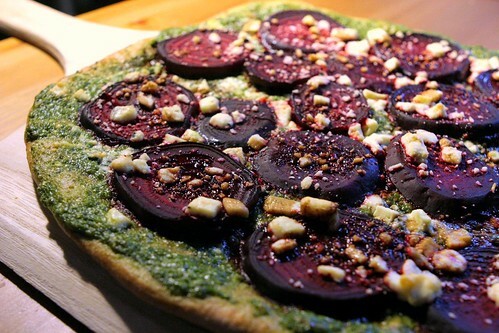 Spread arugula pesto on dough and top with beet slices. Sprinkle cheese crumbles over the beets. Slide pizza onto the preheated stone and bake until crust is crisp, about 8-10 min. Remove pizza from oven and drizzle balsamic vinegar over the pizza. Let cool for a couple minutes, and serve. What a unique and beautiful pizza! I love arugula pesto! Very creative and pretty! I love me some moldy cheese, too, - yum! I'm always looking for creative ways to use beets- this is the most creative I've seen yet! great idea! I love the finished product! Beet and arugula sounds delicious. My opinion on pizza tends to be - homemade is best, and the more unique the toppings are, the better! This looks delicious! Pesto and beets...I wouldn't have thought to combine the two, but why not! I have never had beets on pizza! But I like the sound of it, sounds very nutritional too! Well, if it is pizza you can count me in! I love pizza and I eat all types and shapes. this one looks particularly appetizing and very interesting with all the ingredients you have incorporated in this one! delicious pizza here!! i love making them at home, they always seem just a bit better ;) i've got a couple of pumpernickel doughs in my freezer that i need to figure out what to do with!